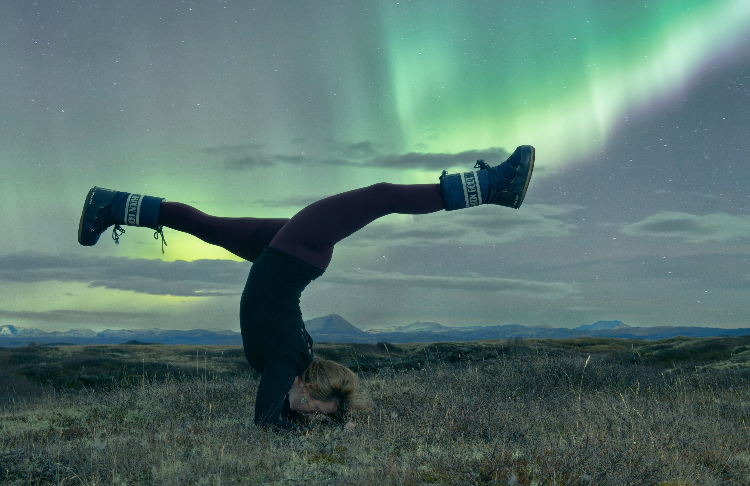 Join Emma Henry for a yoga retreat in wild, remote north Iceland. Sleep in luxury cabins set at the end of a beautiful valley surrounded by mountains. 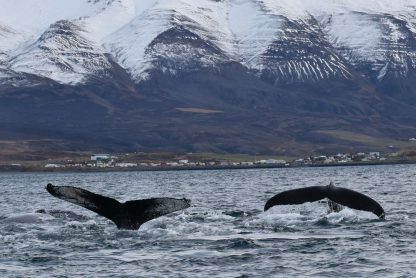 Combine dynamic Jivamukti yoga with options to hike, ride Icelandic horses and watch whales in the fjords. A day exploring Lake Myvatn, a sunset soak in hot pools and the magical Northern Lights make this retreat one of our most exceptional travel experiences in Europe. 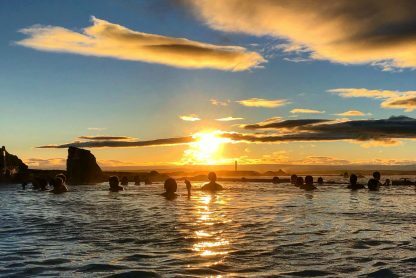 Our location is a wonderful wilderness, perfect for exploring so we have created a programme that combines Jivamukti yoga with lots of adventures, so that you can truly immerse yourself in all that Iceland has to offer. Some of these are included in your package and others are optional, so that you can choose whether to do everything or take time out and chill when you need to. 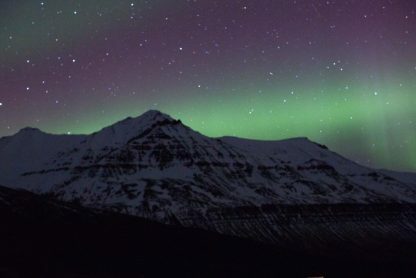 North Iceland in October is the ideal setting to watch the Northern Lights and our remote location with no light pollution means that if they happen, we’ll have a fantastic show! Our private farm includes luxury cabins that look out onto snowy mountains, a yoga barn, bath house, sauna and outdoor hot tub. 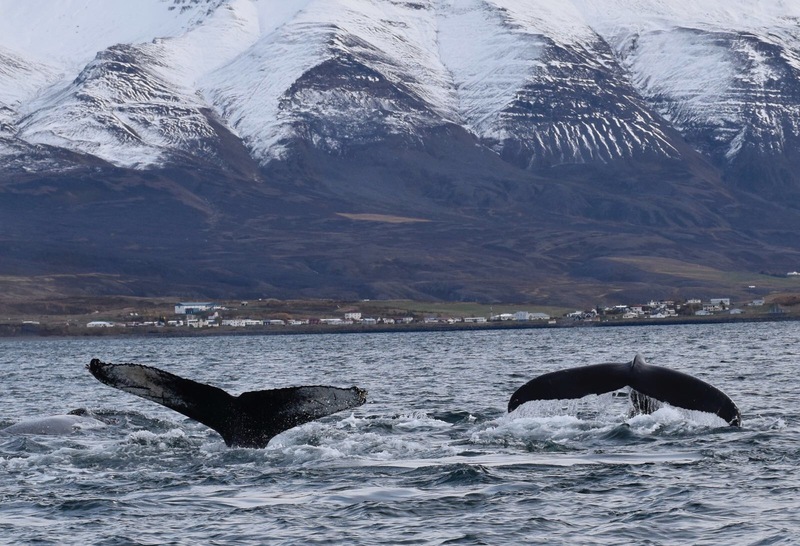 Between classes you can choose to hike, ride Icelandic horses or enjoy epic vistas while whale watching on the fjord. A trip to this part of Iceland would not be complete without a day out at the world famous Lake Mývatn geothermal region, where all that makes Iceland so unique can be experienced within a few hours, from powerful waterfalls, volcanoes, geothermal activity and a nature spa. 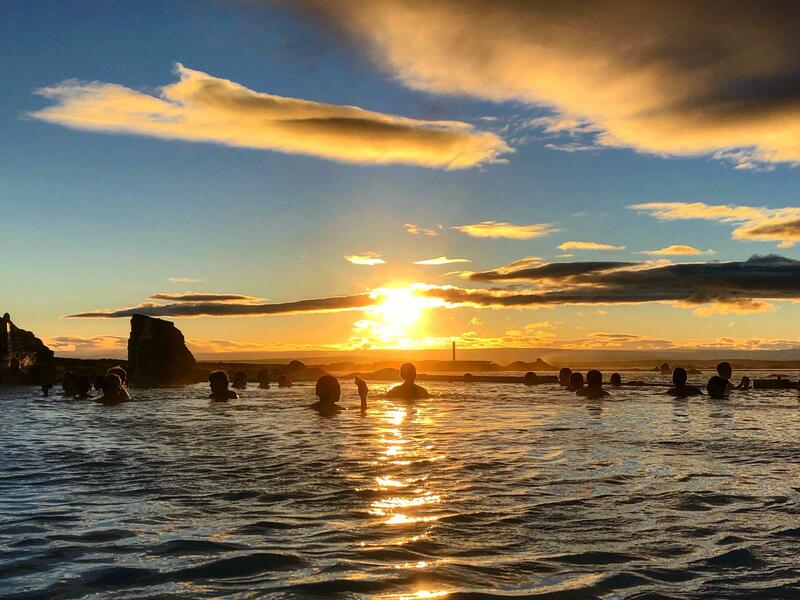 If you’d like to know more, read our blog about our 2018 Iceland yoga retreats. Senior Jivamukti teacher Emma Henry will offer 15 hours of yoga and meditation classes, with 2 yoga classes on most days. Modifications and progressions are given so that everyone will find these yoga classes rewarding but this retreat is not suitable for complete beginners. We recommend that you have previous experience of a flow class and enjoy being challenged by a dynamic style of yoga. It is a yoga style that will require you to commit to your classes. Read more about Jivamukti yoga and try a free online class here. We have 8 beautiful, luxurious cabins located at the edge of our farm with mountain views. Peaceful and secluded these cabins are very special – cosy and warm with big windows so you can feel really immersed in the wild nature all around you. Each cabin has an upper loft with a double bed and a lower floor with a single bed, lounge area and bathroom. We are also able to offer budget accommodation options in our farmhouse where we have 3 cosy rooms. Bathrooms are shared between 2-3 people. Our farmhouse is also where the kitchen is located so the house will be busy between 7.30am-9.30pm. If you are seeking peace and solitude please choose a cabin. If you don’t mind a room in a bustling house then the farmhouse option will work for you. Your meals will be created by our chef Bettina Campolucci Bordi. You’ll be served a plant-based, low gluten menu of tasty and hearty meals, including dishes made with locally sourced wild herbs and nutrient dense berries. Meals will be filling and comforting to sustain you during the cold weather and the many activities during this retreat. If you would like to know more about our food ethos please click here. The nearest airport is Akureyri. 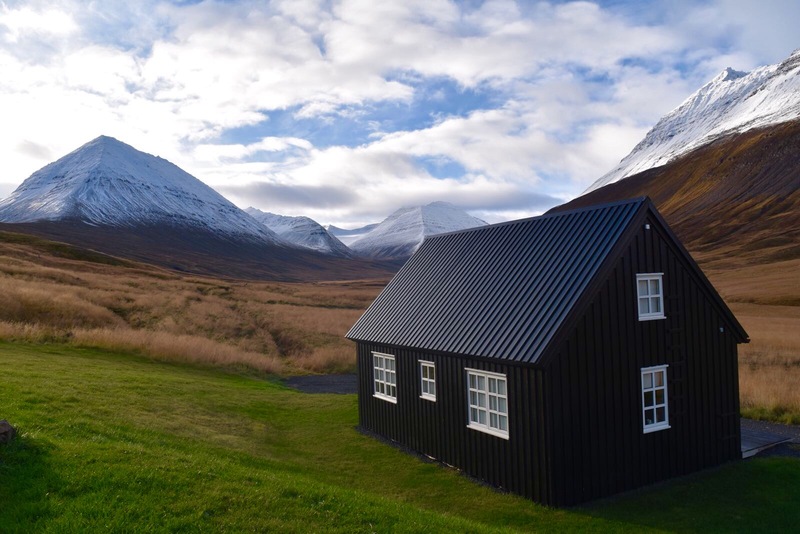 You can fly with Iceland Air, BA, Wow and Easyjet from London to Keflavik airport and then take a connecting flight with Air Iceland Connect to Akureyri. We will send you more details when you book. Airport transfers from Akureyri to our retreat are included in your retreat. We will send pick up and drop times when you you book. What an incredible experience, better than I could have imagined or hoped for. Iceland was a fantastic location, and every detail had been carefully thought through by Jools, Emma and the team. The yoga sessions were excellent and with a view of the mountains, what more could you ask for? 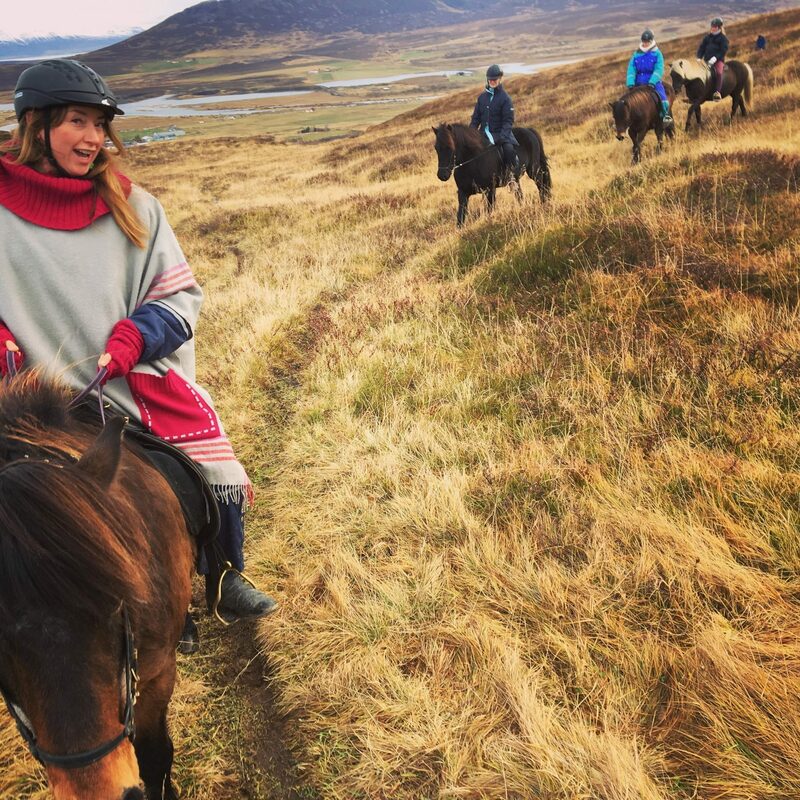 In addition to the place itself the extra activities, hike, horse back riding and whale watching were all good fun – it was a truly magical experience and I look forward to another retreat in 2019. What a magical line up; it all came together beautifully and was so lucky to share the experience with my mum. Iceland is an incredible place – I really was blown away. 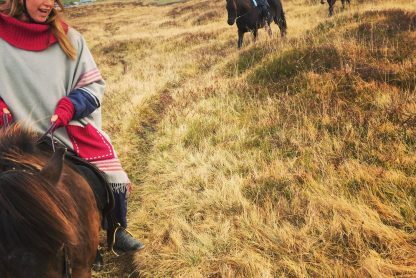 Waking up to mountains every morning was certainly something I could get used to, not to mention the wonderful vegan food (as a vegetarian this was something I welcomed with open arms) and fantastic excursions – the horse riding was a particular highlight for me. I am relatively new to yoga and had only really ever practiced after work in my office with a small group of residents from the building, usually with crumbs scattered across the uneven, creaking floor. Little did I know what yoga could be like – what an eye opener. 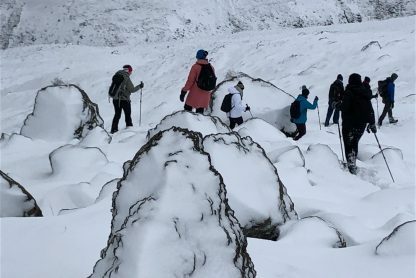 I was so impressed – what a great atmosphere to get truly stuck into it, overlooking the mountains and with Emma, and a whole group of supportive staff, looking out for you from start to finish. What a difference that makes. I now feel inspired to continue my yoga journey and will definitely be planning my next retreat in another one of Reclaim Your Self’s extraordinary locations. Thank you to all the organisers for making it such a success! We arrived in the dark in a snow storm and woke in a beautiful snowy valley – a truly magical setting for our week of yoga and adventure. It was ‘other’ in the best possible sense, from start to finish…. unlike any other retreat I have been on. The setting, the things we saw and did. (Northern Lights, whales, the fumarole-facial-steam – surely only a matter of time before someone trademarks that… ) And the yoga, which encompassed just the right mix of the challenging and the grounding, the uplifting and the nurturing. My first retreat and I LOVED it. 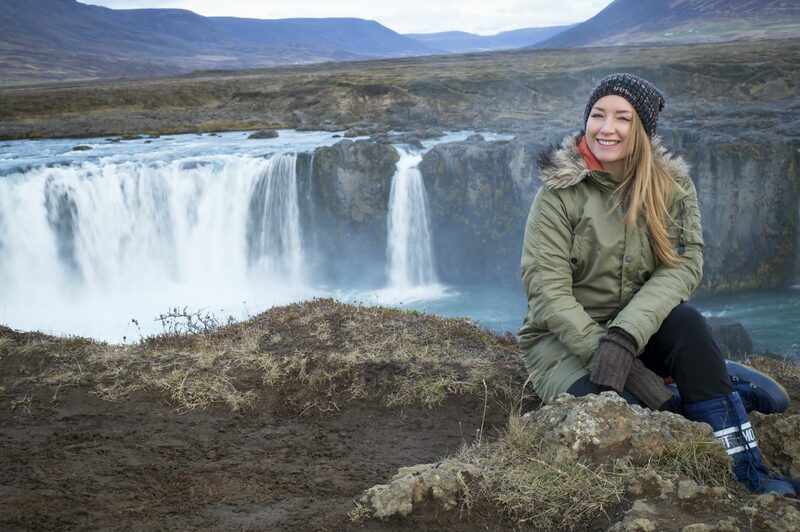 Iceland was magical and I was thrilled to have yoga as a key part of the experience. 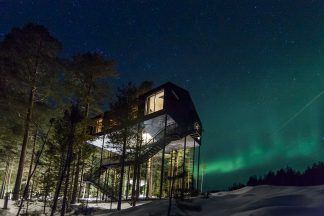 The accommodation was marvellous – beautifully simple with a scandi design that made me envy such clarity. Hiking, food, yoga, northern lights and lovely people. What more could we have wanted. This was my first retreat with Reclaim Yourself and I’m already planning my next! Such a wonderful experience for so many reasons. Jools and her team were there to help in every way and were most definitely part of the group dynamic. Emma Henry is a fantastic and inspiring yoga teacher who will really challenge you. The other retreatees were some of the loveliest people I could choose to spend my holiday with and I made some good friends. 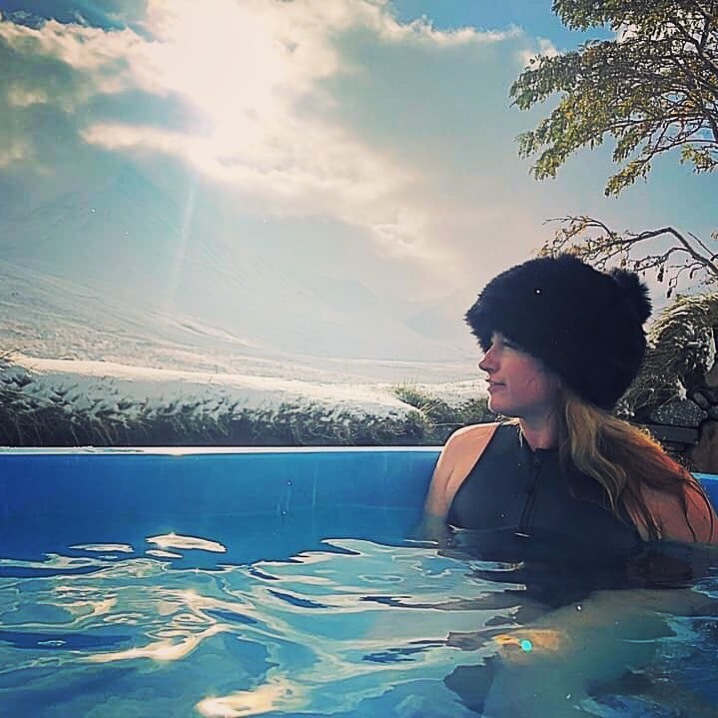 I chose the Iceland retreat because I wanted an action-packed holiday and that’s what I got, but the trips are optional and there’s plenty of opportunities for relaxing. The location is perfect, and one of the reasons this company appeals so much to me is because you go to places where most others don’t venture. The vegan food was very good, especially the sweet snacks!! The organization was amazing, they thought and took care of everything. The yoga was beautiful, a deep inspiration. Emma is a very sweet, great Teacher. The vegan food was delicious and the excursions very nice. Exceptional moments like when we saw the whales and bathed in a magical place. After this retreat I felt in great shape and completely happy. There is something very special about Reclaim Your Self. It is in the details and how smoothly the whole organisation is run. Also the choice of the location, the food and the team that run it. I have only positive memories about my trip in Iceland and it was just as good in Tuscany last year. Well done Jools, Emma and the lovely chefs. To quote a fellow guest on this years Iceland trip, it was the mother of all retreats. I can’t recommend it more highly. The team were fantastically professional and friendly, the yoga was sublime and the snap shot of Iceland we were treated to as part of the trip was truly otherworldly. Incredible experience from start to finish. The venue is one of the most stunning locations I have ever seen and the sight of the Northern Lights over our heads was an exceptional treat. Jool’s team of chefs has opened my eyes to tasty filling nutritious mouth-watering vegan food all cooked on site. The excursions had me giddy with excitement and the fun of travelling around in a minivan with a group of new friends all laughing and enjoying the days made the jaw-dropping scenery of Iceland more enjoyable that I thought possible. The yoga was challenging – exactly what I wanted – and Emma is an excellent teacher who I would rate as one of the best out there. Jools and her team put together an amazing package with just the right amount of everything and I cannot recommend them enough. The only reason I am not going back to Iceland with them next year is I’m going to Japan with Reclaim instead. Where does one even begin to talk about how great this retreat was…the facilities were clean, comfortable and warm. The location was breathtaking. We were able to see the panorama of the mountain and sheep while practicing yoga. The yoga classes offered individual attention and for all levels. The optional day trips were very nice. Everything was well organized…I really enjoyed the fun group, as well!!! This trip was exceptional. I found Emma to be an inspirational teacher, plus we had the added bonus of the class being set in a studio that overlooked a spectacular mountain range. Our cabins were clean, cosy and very comfortable. The food was tasty, nutritious and in perfect balance with the yoga and surroundings. We had a full and interesting itinerary, which enabled us to explore different parts of the Icelandic wilderness. I returned home feeling rejuvenated and re-connected to the natural world. It was a memorable experience and I will definitely be returning. Loved it! A wonderful experience – Emma is a great teacher, the facilities were comfortable and relaxing and the location is beautiful. The yoga classes were targeted at mixed ability and had a focus on development and having fun. Outside of yoga, there was the perfect mix of optional day trips or chilling time. 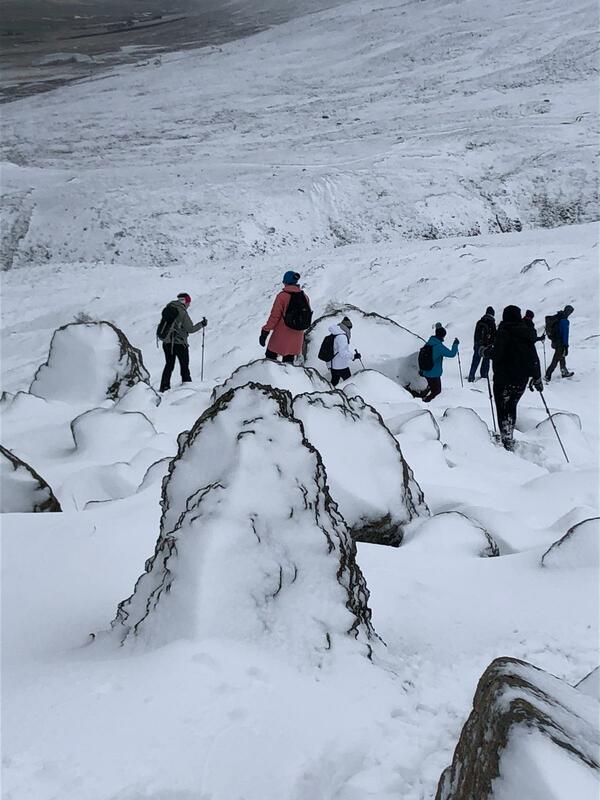 Jools and her team organised everything perfectly, including day trips to see interesting sights, northern lights and whales. Visiting Iceland with Reclaim Yourself was a fabulous experience. Jools, teacher Emma and the whole team are caring, attentive and their experience in running retreats is evident. I loved all aspects of the retreat, the location, the yoga and the healthy food. A perfect balance of yoga and adventure in a wild and remote corner of the world. And as this was my second retreat with Reclaim Yourself (first was to Mongolia!) I highly recommend going to Iceland. You will come away feeling happy, healthy and full of wonder. My week in Iceland with Reclaim Yourself in October 2016 was simply amazing. 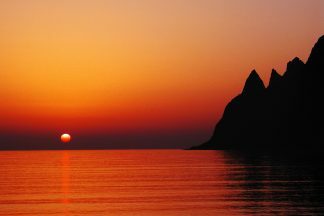 The combination of intensive yoga classes, nourishing food and magical scenery made for the most awesome and unique holiday. To top it off, we got to see the Northern Lights, which was the icing on the cake. 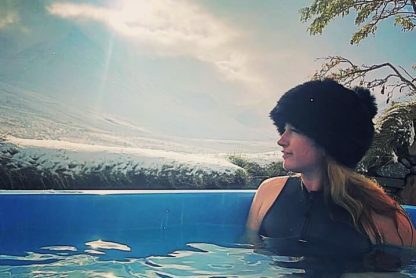 I’d highly recommend Iceland as a destination, and Reclaim Yourself as the hosts to give you the best, most unique experience. This trip was exceptional. Emma is an inspirational teacher and the studio overlooks a spectacular mountain range. Our cabins were clean, cosy and very comfortable. The food was tasty, nutritious and I loved exploring the Icelandic wilderness. It was a memorable experience and I will definitely be returning. Loved it!